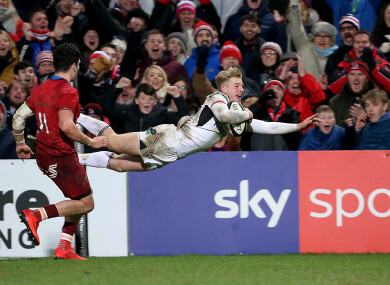 Ulster's Rob Lyttle scores a try. MUNSTER HEAD COACH Johann van Graan couldn’t hide his disappointment with Munster’s loss to Ulster at Kingspan Stadium, but also admitted Sam Arnold’s red card was the correct decision. The South African watched his side amass a 17-0 lead at half-time off the back of a thoroughly dominant pack performance that led to two maul tries from Niall Scannell and a penalty try off a scrum. However, with Fineen Wycherley already in the sin bin, centre Sammy Arnold saw red for a dangerous hit on Christian Leali’ifano in the 58th minute, and from there Ulster clawed back to take a bonus point in a 24-17 victory. Arnold’s sending off couldn’t have been timed worse as it happened just after Ulster scored their first try, the centre rushing out of the line and hitting Australian fly-half Leali’ifano on the head at some force. “Sammy went for the tackle and hit him in the head, and unfortunately the referee doesn’t have any other choice but to red card him,” Van Graan said. It’s a tough result for Van Graan to take given his side didn’t look to be under much threat until Arnold was given his marching orders, at which point the tide turned in favour of the hosts. There are plenty of things for the southern province to take going forward, particularly up front where they were so strong and defensively for the majority of the game. But, by the time Rob Lyttle crossed for Ulster’s fourth try with the final play, it was clear that playing an intense interpro with one less man for 20 minutes had taken its toll on the players, who couldn’t get across to stop the winger. Nevertheless, Van Graan was looking to the positives after the defeat, their second interprovincial defeat in as many weeks. “I can’t fault the efforts of the players,” he praised. “Very happy with the pack, scrummaging I thought everyone put in the hard yards, so I’m very happy with that. “I thought our lineout contest went very well. I thought our breakdown contesting went very well as well, our loose forwards with Niall (Scannell) and James (Cronin). However, at the end of the day it is only a point from a game that the Munstermen led by double figures at the break, which will no doubt have left a sour taste in the mouth on the drive home. They now return to Thomond Park on Saturday and welcome Connacht for the final interpro before going back to European action a week later with a win badly needed at least for gathering some momentum. Easier said than done as Connacht are in good form having thumped Ulster in Galway a week ago before nearly taking an even more impressive win at Leinster yesterday, falling just short. For now, though, Van Graan is focusing firmly on getting to the bottom of this defeat in Belfast before turning his attentions to their western visitors. “I’m emotional right now and I haven’t reviewed the game, so I’d like to watch it again,” he said. “Like I said before, can’t fault the effort, unfortunately our discipline let us down. Email “'Our discipline let us down' - Van Graan rues missed opportunity in Belfast ”. Feedback on “'Our discipline let us down' - Van Graan rues missed opportunity in Belfast ”.